This blog is supposed to be about my bike ride from Shanghai to England, so I suppose I ought to write about something vaguely relevant at some point. I'm counting down the days till take-off. D-day is set for 5th September. I'm hoping the temperature will come down a little before then, because cycling in high humidity at 38 degrees C is not too much fun. Shanghai seems to have drained pretty quickly after yesterday's flooding. Rob Lilwall ran into quite a bit of flooding a month or two ago in south China. He also managed an embarrassing slo-mo wipe-out for which Jeremy Beadle standing by, camera at the ready. I don't have my route through southern China planned in detail yet. Somehow or other I will make my way to Nanning, where I can pick up a visa for Vietnam. 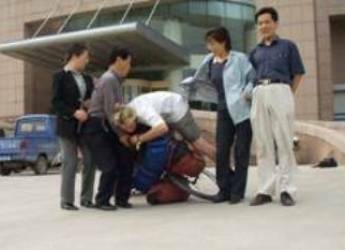 Last time I was waiting for a visa application to be processed, in Ulan Bator, some bloke's horse nicked my bike. I will try to be more careful this time. Emily has just accused me of having "really hairy elbows". I'm off to get them waxed.